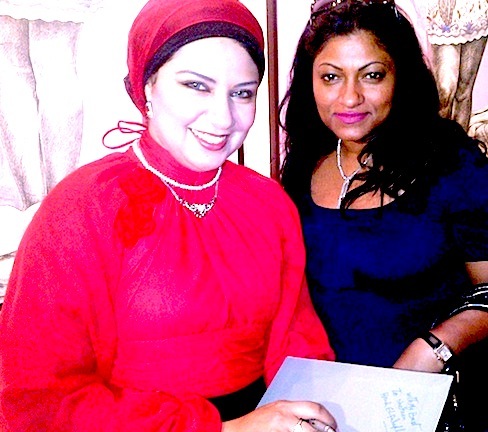 The last time I met and did a blog on Hend Al Falafly, a crazy thing happened. Someone actually thought the lady in one of her paintings was me and sent me a text saying I should cover my aura – the image I had used was not vulgar at all. What I liked about it was the element of sensuality that oozes from Hend’s work relating to women but I guess the guy was not familiar about subtly or that art is art and I certainly do not look like the kind of chick who has the patience to pose for a painting. Earlier tonight (Well yesterday actually as it is 1am in the morning), Hend opened a new exhibition at Art Sawa. Hend was born in Cairo in 1979 and lives and works in Cairo too. I met her during her last visit and cant wait to see her new art collection sometime this week. During my childhood, my father who was an architect was drawing his architectural designs by using colors and I got influenced just watching him till I went to school. Thanks to his direct influence, my drawings become distinctive from the rest of the class. Later on and always encouraged by him, I have several times participated in painting competitions and I proudly got always the first place over the years of study at the school first and college later. What was your first exhibition and where? I was 17 when I began studying art at the Faculty of Fine Arts & in year 97, I participated for the first time at the students exhibition I was very excited to show my work in my first group exhibition to finally receive the feedback by the critics and the audience. Well received, it was the starter for many other collective shows till I got my first solo exhibition “in Cairo” in 2004, at Biskuah Hall. What is the inspiration behind you r Work? The common and daily life firstly inspired me, leading me to focus of the women, their situation and its expression through the body language. What are the messages you convey through your art? My main message is themed around the woman condition in my society using the body language, the reflection of the said and non-said depicted in a very realistic expression. Tell us about this show.. SEVEN SINS? 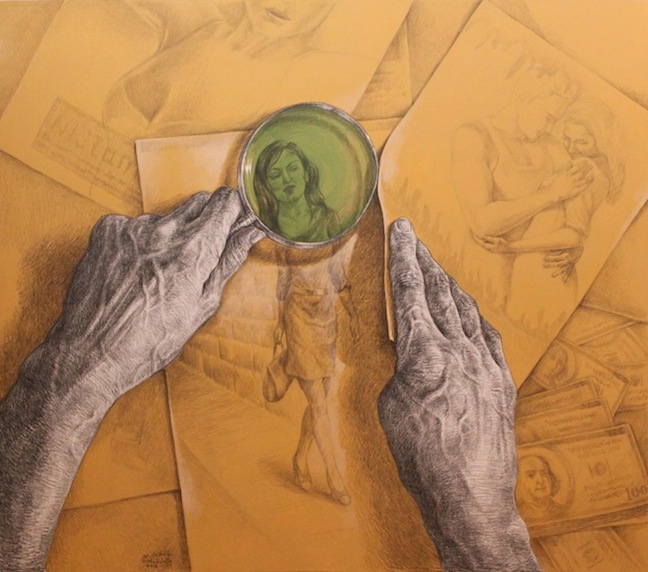 In this body of works, the seven sins, the idea is to highlight human conscience and to define to my own thoughts about the human characteristics and their actions and reactions as well. I found, indeed, in the thematic “the seven sins ³a fertile material for my own creativity and the representation of the human nature & body. How did you select the works for this exhibition? I thought a lot about all of the attributes of the seven sins and made several sketches to the artworks after some research in the how prior have envisioned them I finally addressed my own vision in this series of works. When you choose works for a show in Dubai, are they different from works for the shows in another country? Different than for shows elsewhere? Not really but I have to say that each body of works is a challenge to myself for a deep exploration of an idea or a concept that I would like to translate to another level of thinking. As you appropriate icons from local, regional, and international contexts. Do you envision these having different meanings/messages in each context? I, for sure, believe in the meaning of the ideas and thoughts from are different in each culture, and I realize that their perceptions can be received differently. How does you envision you future of art on? If so how will it be accomplished? I realize that each artist’s present and future depends on his/her political, social and cultural surroundings and they are be truly effective on the artist expression.